It happens at the end of every summer season. Between the concentrated efforts we all put in for the 9 weeks of our summer season, the short hours of sleep and the continual decrease in the staff roster, sickness strikes. It is stealthy at the onset, seeming to only target one person, but the snowball of affliction slowly picks up speed as it plunges down the slope, accumulating the remaining staff members like helpless snowflakes. Yesterday, I became one of those snowflakes. I didn’t feel unwell when I woke up yesterday morning but, when I greeted my dog, my usual alto voice was expressed as a baritone. It came as a shock to us both. I tried to get through the rest of our morning routine, essentially in silence, and made my way into work. The three cups of coffee did nothing to negate my feeling of infirmity and, although I gave it my best effort, I eventually conceded the loss to my state of ill-health and came home. What should have been a restful sleep, thanks to some nighttime medication, became a series of small naps interrupted by superfluous coughing spasms. 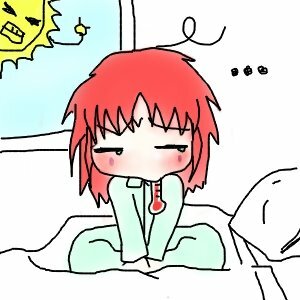 Being sick in the summer is a truly undesirable ordeal. I struggled through my work day again today but now find myself wrapped in a blanket on my couch on a balmy summer day. I’m giving this cough medicine one more chance. If it doesn’t work – it’s Hot Toddies for me tomorrow!